Accepting a head coaching job in early December isn’t easy, particularly when you have to move from one side of the country to the other. That’s exactly what Jason Fortier did. Accepting a head coaching job in early December isn’t easy, particularly when you have to move from one side of the country to the other. That’s exactly what Jason Fortier did. 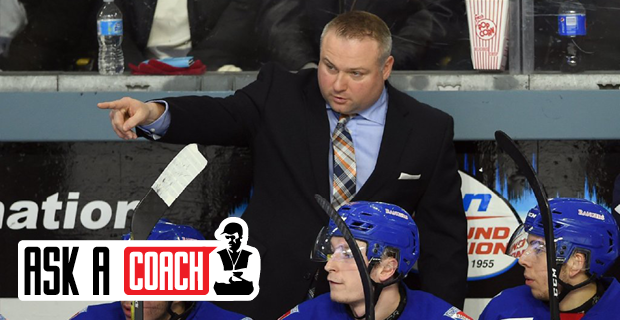 The new bench boss of the BCHL’s Coquitlam Express went from the Rouyn-Noranda Huskies of the Quebec Major Junior Hockey League to the Ontario Hockey League’s Kitchener Rangers and now finds himself all the way in B.C. Kelvin Cech, The Coaches Site: Coming from the east to the BCHL, what are the differences in styles you expect? Jason Fortier: The difference from an Ontario perspective, first of all, is that it’s a little bit older here. You might find some really high end 16-year-olds in Ontario, but they’re typically brought in to play a depth role. Out here it’s older, it’s a heavy brand of hockey and there’s more of a professional atmosphere. Not all the rinks in Ontario are made the same. The BCHL focuses on that path to an NCAA scholarship. How do you keep players focused on the task at hand while also working toward individual goals? Coming back from major junior, there are some great things I learned there that I can implement here. We had a lot of success in Toronto getting players to the next level and to the NCAA. You just have to focus on yourself. Focus on your school. These players have to rest and be mentally prepared. The burnout isn’t so much physical but mental. If players feel prepared and rested and they’ve taken care of their homework then you’re a lot more relaxed and confident. The stress level goes down. We focus on daily habits. Find a way to be successful in hockey and daily life. The word I like to follow is passionate. I want the players to be passionate, and that’s what I try to bring to the game. As coaches we all want to have a handle on habits and details, but I want to coach the individual and hold them to a standard that’s truly unique. Sometimes you can hold them to a standard that’s different from what they hold themselves to as well. Junior hockey games are primarily held later in the week, on the weekend. How do you structure your week? This was my first week, but on this past Monday we did a skills day, stationary work, footwork, edge work, and puck work, and we added some components in for our goaltenders. You’re going to win more games when you have talented hockey players. You’ll never watch the Kentucky Derby and see the jockey beat the horse around the track. The players like it too, gives them break mentally. This Tuesday was more of a walk-through and re-capping things we did well and looking at things we need to improve on. I’ve seen a great response already, it’s been a fun week. It’s a fresh start for yourself and the Coquitlam Express. What’s your plan to get the team heading in the right direction? The one big thing is just trying to find a common goal for everybody. Finding our purpose, and then making a plan for how to get there. I’m a big believer in the process. Don’t focus on the result, focus on what you do well. I’ve given them a clear indication of where I want us to go and how we’re going to get there. I believe in accountability and we all need to do our part to make this one of the elite programs in the BCHL. When this offer came around I jumped at the opportunity and I think we’re going to surprise people. I need to surround myself and the guys with people who share the same values and want to be part of something special and create memories that are going to last a lifetime.